Even though I'm not running right now due to unforeseen circumstances, I'm trying to think positively and hope to be back ASAP. In the meantime, I'm always on the lookout for unique and super cool races to put on my bucket list for the future. I'm not talking just "themed" races like the NYRR Scotland Run (which was totally fun by the way!) but something incredibly original and out there. 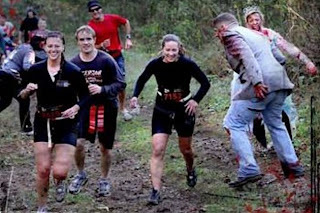 For example, the crazy Zombie 5K race and obstacle course. This one, of course, will never come close enough to NYC. Why? Because I want it to. Grr. Maybe if I ask nicely the race organizers will create an Zombie race near me. I may have to use the puppy dog eyes for this one. So when I'm totally bored I usually peruse the web aimlessly and see where the wind blows me. Usually it blows me to pinterest, this blog, or to some random video of a baby laughing or something. What can I say, YouTube really gets me hooked! Each kilometer of the event is associated with a designated color. 1k is yellow, 2k is blue, 3k is green, 4k is pink, and the 5k finish is a “Color Extravaganza.” As the runners/walkers hit the Kilometer COLOR RUN Zones, they will be blitzed by our volunteers, sponsors, and staff with COLOR. The color is a special “elf made” recipe of magical color dust. All products are 100% natural and safe. You can eat the stuff if you’d like (we have tried it and don’t suggest it, it is surprisingly high in calories and leaves a chalky aftertaste). And I'm guessing this is the "Color Extravaganza". Just a guess. So I don't know about all of you, but I would LOVE to do this. Definitely a change from the normal Central Park loop, I'd say. This is probably more of a race just to have fun at and not think about a PR, which is probably good for everyone to have every once in a while. A change of pace! Literally. 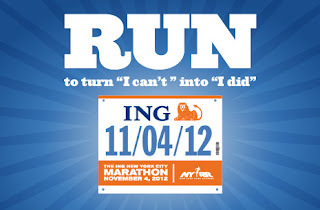 I figured I would mention this race because... drum roll... it is coming to New York City! Yes, a cool race like this is coming to me! While there isn't any information about exactly where it is going to be held, they did say it will be on August 25. So keep your calendars open New Yorkers. And if you are currently on the fence... tell me this video doesn't make you want to run it. In other news, be sure to register for the NYC Marathon lottery. Registration is only open until April 23rd so if you are undecided, get a move on it. I'm not running it this year but will be next year (ah!) after I complete my 9+1 for guaranteed entry. Good luck to all the applicants! PS. I totally love their slogan for this year. Who else likes it? I know I promised to update you all about the quinoa and black bean burgers I made for dinner yesterday. Well, I'm doing that now and I have to say... they were SO GOOD! I was actually surprised how much I liked them. Karl even told me he would order them over a regular burger (since you don't know him, Karl hates health food and loves meat... so that's a huge compliment coming from him). The only edit I would make to the recipe would be to add another egg white to the mix just to help it stay together a little better. The ends of the burger kept trying to fall apart. But overall, its a winner. I liked it so much I made the leftover mix into a patty for lunch today. When I like a food, I eat it so much that eventually I get seriously sick of it. That's a habit I need to break or else I'll have nothing left to eat in my life pretty soon! Plus, I want these burgers to stick around.. I had the burger with one of my flaxseed smoothies. So filling! Have you run or found out about any unique races? Are you registering for the NYC Marathon lottery? Anyone else doing the 9+1 program for the 2013 marathon? What races are you running? we are so doing the color race together. Definitely! I'll let you know when registration opens. I was going to do the Color Run with my kids for my birthday this weekend but it ended up selling out. Plus, I'm pretty sure I'd be dropping about $200 to have one kid have fun, one get competitive and the other whine the entire time. If I'm paying that much money I want the "h" dropped from my wine :) Looks super fun though! Hahaa love that line: "I want the "h" dropped from my wine". I agree! I heard somewhere the Zombie race will be coming to town. Just saying. Maybe we should arrange a field trip??? I'm keeping an eye on the Zombie race so I hope it comes here. But I really like your thinking.. a field trip to a Zombie race? What could be better?! You should look into the Warrior Dash, Tough Mudder, Muddy Buddy, and Great Urban race. I've done the Warrior Dash and the Great Urban race and both were TONS of fun. I'm not sure whether or not these are near New York but I know they all "traveling races". The Color Race looks like sooooo much fun! I'm going to have to check out if they come to Texas. I would love to do those races! Especially the Warrior Dash. I'll have to see if they come nearby or take a trip out to them :) Definitely need to go to a boot camp class or something to prepare if I do that! I am hooked to your blog! I really enjoy reading it. I live in Europe and it is not easy to sign up to all these races but the color race sounds so much fun!! My dream is still to run NYC marathon one day!! I managed to run 2x20', i used the foam roller and hip exercises i hope my knee is not painful tomorrow...After 4 months my Physio gave me the green light to start running every other day on a very slow pace...lets see how it goes!! Are you stopping running all together for now? Thank you so much, that means a lot to me :) You should try to run the NYC Marathon in 2013 (that's when I'm hoping to run it). Its my dream too for sure! So glad you were able to run again!! I'd love to hear updates about how you are doing as you return to running, especially since you are a fellow IT Band Syndrome sufferer. I'd love any advice! I'm not running right now, my doc said to wait about 2 more weeks and then try running again. Crossing my fingers I won't have pain!